My love affair with Baler started in April 2014, when I went there on a whim with two friends who had nothing to do on a weekend. Since then, I have been there about 5-6 times. I would say that's more than I expected for a place that makes you take a 6-hour bus ride at midnight just to get there. But I got addicted to the stoke (and okay, because secretly, I've always wanted to be a surfer). And so whenever I think of Baler, I would think about surfing. More than that, however, every trip I made there felt more and more like visiting home; seeing familiar faces and being remembered by people as well... and it's a nice feeling. Shoutout to all the mermaids who can't be away from the waters for too long! Press Start Cafe was a little difficult to catch, as they would close at certain times of the day because the chef would go surfing. According to Arman, the brother of the owner, they would normally be open from 7AM - 3PM for breakfast and lunch, and then reopen at 6PM. The in-between is surf time! Hey, #lifestylegoals amirite? They are located on Alley 2, an alley across Desiree Lodge. Be on the lookout for the wooden sign to lead you to where they are. And please say hello to them from me if you drop by! My favorites are their Beef Pastrami sandwich and the Margherita pizza. You must try their pizza! They make their pizza from scratch, which makes all the difference. Skip the frozen pizza places and just go straight to Press Start! You also get to see Chef Mako cook your food as you order, so you know it's freshly made. 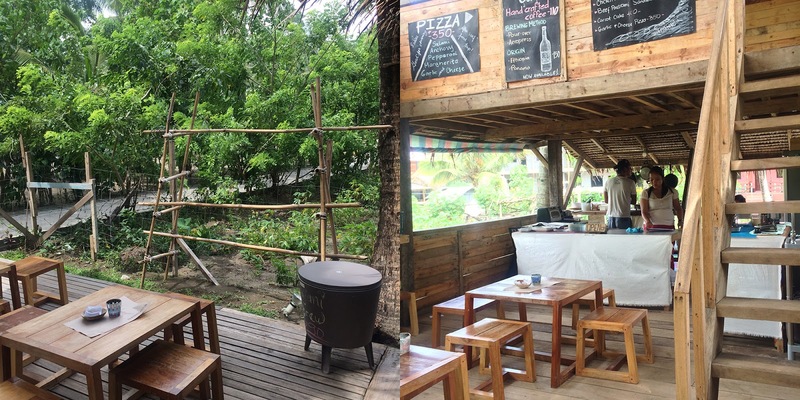 Groundswell Cafe (at Charlie Does) is one of the first establishments you'll find as you get to Buton Street. It is right behind Costa Pacifica, inside Charlie Does--which is a surf shop. They have your regular coffee and other tasty blends like Peanut Butter Coffee and Salted Caramel Coffee (loved this! ), as well as tea. You might even chance upon Justice, your friendly neighborhood Labrador who loves the waters. If you don't see him at Charlie Does, he might be swimming at Sabang Beach. PLUS: They have an amazing playlist! I wish I asked for it as I was Shazam-ing everything the whole time. BONUS! If you happen to be dining at Hungry Surfer (at Bay's Inn), you should also try out their iced coffee. You can have it in shake form or plain and simple over ice. Both are tasty and perfect for waking you up on hot mornings. 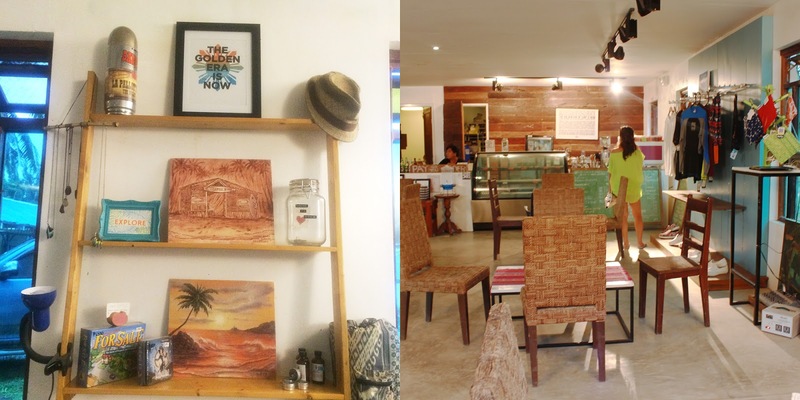 So whether you want to take a break from the waters or want a quiet afternoon to enjoy the slow hours, check out these cafes with your friends or on your own. 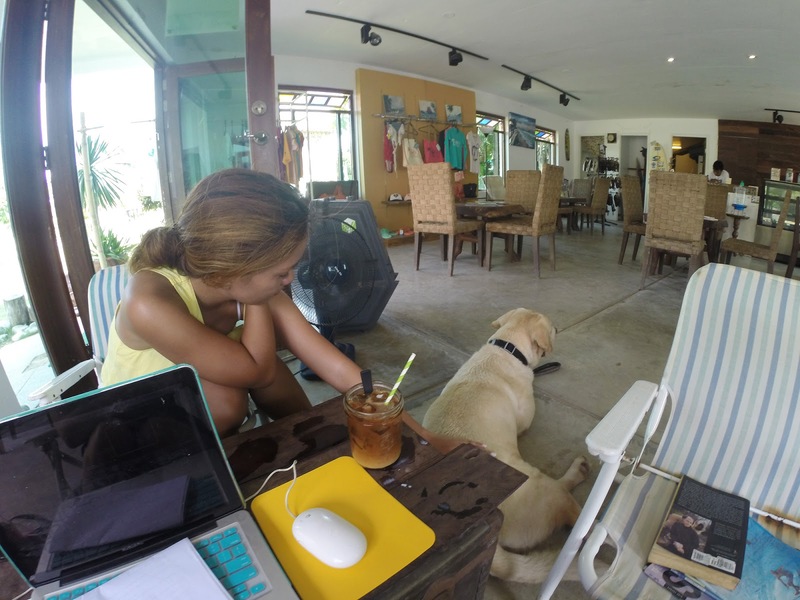 Baler is a community that is warm and friendly, so you're bound to make friends there anyway! Hi megan! Your feed is so helpful! I'm currently in baler now and I'm looking for the cool cafés. Im glad i saw your blog.